Are you are environmentally conscious, or do you wish to send off your guest with a memorable gift? Either way, our ecovites are just the right kind of invitation cards for you. This line of invitations will keep on giving, even long after your event is over. Other than trashing or recycling their cards, your guests get to up-cycle them! Depending on your paper selection, each card in this series (when planted) will blossom into beautiful wild flowers or edible herbs and veggies. For a card that keeps on giving, give your guests an ecovite. 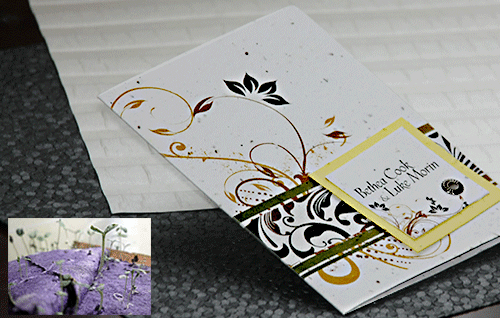 Like with all our lines of invitation cards, we offer you a variety of cards to pick from. The options include: folded invitations, stand alone invitations (with the option of including pockets), as well as all in one integrated invitations. Along with these options, we also offer you the choice to have your invitations ink printed, laser cut or laser engraved. Like with all our invitation cards, you always have the option of getting your invitations personalized, as well as working with us to create a custom hand made invitation for you. We will work with you, to ensure that your invitations best suit and meet your needs, as well as the needs of your event. Give your guests an invitation card that they will remember. A tangible memory of your event, that will keep on giving, long after your special event is over.